Africa is a continent renowned for the imagination, resourcefulness, and ingenuity of its designers and makers. This ingenuity, born out of necessity and a pioneering can-do spirit, is drawing the attention of a wider world looking for lasting solutions towards pressing problems such as the accumulation of waste and design for meaningful social change. And regardless of who or where you are scarcity forces you to become imaginative with what you have, and when you truly push yourself amazing things can happen. 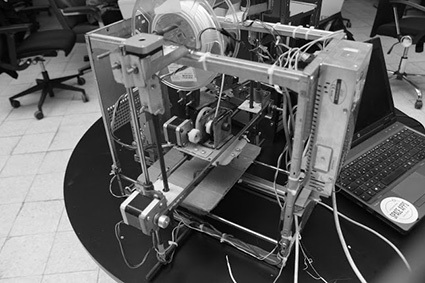 One such example is WoeLab in Lomé, Togo, where a group of inventors and makers have created a 3D printing machine from e-waste. E-waste is a growing problem across much of Africa. Local and international dumping of unwanted equipment means it inevitably ends up on the street. And insufficient policy in place to tackle the issue has seen enterprising individuals and organisations working within their communities to find solutions.